Happy day after Halloween. I am happy to report that the kiddos all received a gullet full of candy and declared the holiday a complete success. As you can see below, they brought out their Halloween finest. Pictured from left to right are Ainsley, Graham and Sydney with Aunt Jenny peeking over their shoulders. But, that is not the tricky part. Can you find me? Become a follower of @NBFoundation and tweet my location in the picture with the tag #WheresMarko before 8:00 AM CST on November 2, 2010 and you will be eligible to win a $25 gift certificate to Chili's. One winner will be drawn at random from the correct entries. New to Twitter? Never heard of it? Click here for instructions on how to get started. 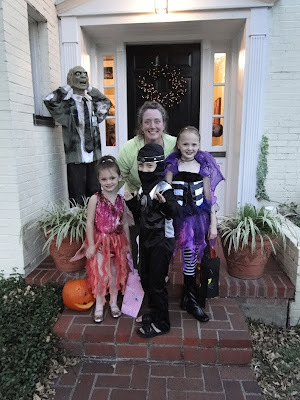 When Sydney was asked by people handing out candy what her costume was she explained that she was a "jail fairy"
The wing on Ainsley's costume kept flopping over giving the impression of a broken wing. She described herself as a "broken angel."